And you, who are up to 20 years old, TALK! Join F2G#CREW till 30/04 & take a 5.04€ gift instantly! 100' to all online bonus! Walkie Talkie, for unlimited free calls, with a duration up to 3"
Magic Numbers, for 1500’ to your 3 best buddies. Order a new connection or bring your current number to F2G! I want to keep my current number. I want to a new number. I want to be updated with F2G’s offers and latest news with phone call or digital communication. F2G #crew is not for everyone! You have to be under 20 years old. 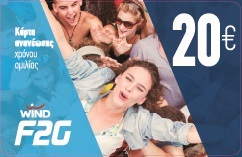 If you are an adult (18-20), you can join F2G #crew by providing your ID card details. If you are under 18, an adult will have to register your prepaid number. This person will be considered to be the "present owner of the number/subscriber". Fill in his/her detail and he/she will have to receive and sign for your card. When you receive your SIM card, you will have to make one outgoing call to activate it. Withing 24 hours, you will receive an SMS welcoming you to F2G #crew. 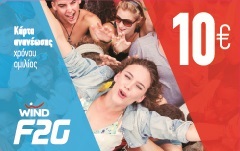 F2G #crew Bundle: 200’ to all & 1GB, for 5.04€, valid for 30 days. F2G #crew Bundle online bonus: 100’ to all. Walkie Talkie: Unlimited free calls, with a duration of up to 3"
The application to join F2G #crew is valid exclusively for new prepaid connections & subscribers who wish to bring their mobile number to the WIND network. If you are already a WIND/Q subscriber and wish to join F2G #crew, visit a WIND/Public store, with your ID card. NOTE: If the personal details are not verified, you will not be able to join F2G #crew. Minors who don't have an ID card will not be able to join F2G #crew.